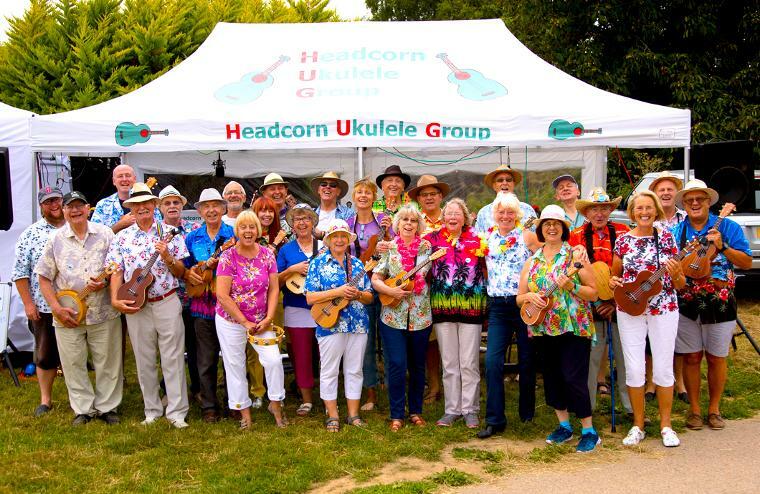 Headcorn Ukulele Group is an enthusiastic and friendly ukulele club which meets regularly in Headcorn for strumming, singing, and fun. Headcorn Ukulele Group, also known as HUG, was formed in May 2014 when most of the members were beginners. We have learned together and improved as a group and as individuals. We are a friendly group and we welcome everyone who plays the ukulele from complete beginners to advanced players. We meet on the 2nd, 3rd, 4th, and 5th Monday of each month and every Wednesday morning. (We do not meet on Bank Holidays). The Monday night sessions are in the main Andred Hall at Headcorn Village Hall in Headcorn, Kent. 7.45-9.45pm. The Wednesday mornings sessions are in the Meeting Room at Headcorn Village Hall in Headcorn, Kent. 10am-12pm. On the 1st Monday of each month there is a Pub Jam Session at The George and Dragon pub in Headcorn where some of our members can be found. It starts at 7.30pm and ends at the end!